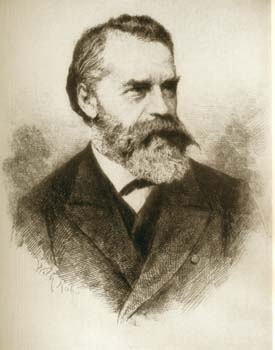 German historian Ferdinand Gregorovius (1821-1891). Ferdinand Gregorovius (January 19, 1821 – May 1, 1891) was a German historian who specialized in the medieval history of Rome. He is best known for the monumental work Die Geschichte der Stadt Rom im Mittelalter ("History of the City of Rome in the Middle Ages"), a work of much erudition and a classic for Medieval and early Renaissance history, dealing with the history of Rome from about A.D. 400 to the death of Pope Clement VII in 1534. In the words of its author it describes: "how, from the time of Charles the Great (Charlemagne) to that of Charles V, the historic system of the papacy remained inseparable from that of the Empire." According to Jesuit priest John Hardon, S.J., Gregorovius was "a bitter enemy of the popes." 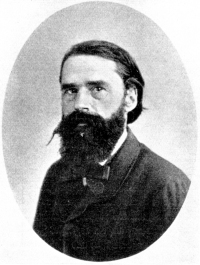 German historian Ferdinand Gregorovius was born at Neidenburg (Nidzica), East Prussia, and studied theology and philosophy at the University of Königsberg. In 1838 he joined the Corps Masovia academic student corps. After spending some years in teaching he took up his residence in Italy in 1852, remaining in that country for over twenty years. In 1876 he was made honorary citizen of Rome, the first German to be awarded this honor. A street and a square is named after him. He eventually returned to Germany, where he died in Munich on the 1st of May 1891. German historian Ferdinand Gregorovius (before 1891). Der Tod des Tiberius (1851); ("Tiberius' Death") - a drama. Geschichte des Kaisers Hadrian and seiner Zeit (Konigsberg, 1851); English translation by M. E. Robinson ("History of the Roman Emperor Hadrian and His Times", 1898). Der Ghetto und die Juden in Rom (1853); (Mit Einem Geleitwort von Leo Baeck, Im Schocken Verlag/Berlin, 1935). Geschichte der Stadt Rom im Mittelalter (1859–1872); English translation - ("The History of Rome in the Middle Ages" (1894–1902)). Re-issued by Italica Press, 2000–2004. Wanderjahre in Italien (1856–1877); (5 vols., Leipzig, 1888-1892). Later in 1881 as: Die Grabdenkmäler der Päpste, 2nd ed., (Leipzig, 1881); In English as "The Tombs of the Popes" (Tr: Louisa W. Terry) Victoria Press, Rome 1904. Urban VIII. im Widerspruch zu Spanien and dem Kaiser (Stuttgart, 1879). This last work was translated into Italian by the author himself (Rome, 1879). His Romische Tagebiicher were edited by F. Althaus (Stuttgart, 1892), and were translated into English as the Roman Journals of F. Gregorovius, by A. Hamilton (1907). ("History of Athens in the Middle Ages. From Justinian to the Turkish Conquest." Stuttgart, 1889. ↑ Fr. John A. Hardon, S.J.. Christ to Catholicism: PART ONE: APOLOGETIC FOUNDATIONS: IV. Recognizing the True Church. Inter Mirifica, 1998. Ferdinand Gregorovius. Encyclopedia Britannica 1911. (Greek) Greek Wikipedia. Ιστορία της πόλης των Αθηνών κατά τον Μεσαίωνα. Publ. C.H. Beck (in German). (German) Projekt Gutenberg - DE. Ferdinand Gregorovius. (Biography). Gregorovius, Ferdinand, 1821-1891 (Works). Project Gutenberg. This page was last edited on December 9, 2012, at 03:17.